« The Mighty Mazda: the Best Car ITW!!! Last night I climbed a rope. And today it’s still a big deal. In January Josh Hanagarne, of the World’s Strongest Librarian, met his 2010 goal on the second day of the year. After watching that, I decided I wanted a goal too. 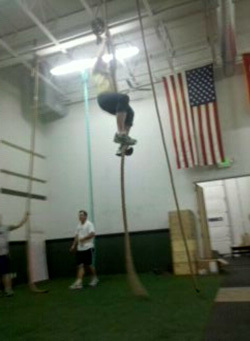 So I marched into the gym and declared to my coach that I wanted to learn how to climb a rope. I’ve never climbed a rope in my life. Never. The fact that I wanted to climb a rope and even go to CrossFit is a big deal. Growing up, I hated working out. I was never the girl who played sports (only non-cut sports, thank you very much). Never loved gym class. I swear I was the only girl in school who sweated during class and whose face was beat red after running “the mile.” You’re already self-conscious enough when surviving middle school, so why the heck to they add physical education on top of it? (for the love of the education system, do not answer that). I also hate gyms. My friend Lindsey recently wrote about the culture of gyms in Paris. And while most adults in the U.S. don’t dress up to go to the gym and workout, I still felt unwelcome in the 24HourFitness-es of the world. So the fact that I enjoy this crazy thing called CrossFit is an extreme accomplishment on it’s own. Like most great things in life, I was introduced to CrossFit by a friend. He kept talking about how much he loved the people at his gym and the workouts that they did. Alright, I thought, I’ll try it. My first trainer was Fran, who just opened her own affiliate gym. She showed me how to squat, what a kettlebell was, and how to clean, jerk, and thrust the damn thing. She made my body hurt in ways I didn’t know it could and that was only the beginning. Fran was enthusiastic about CrossFit. Passion was flowing out of her and it was contagious. I caught it and I kept going back for more. I feel in love with lifting. I fell in love with the people at my gym. We all sweat. We all turn beat red in the face. We all push our bodies so hard that collapse when we’re done. We strive for personal records. We encourage each other to “push” and to “pull” and, goddamn-it, you can do this, just one more. We are a community of people who are psychotic about fitness. I was hooked. I never thought I would love lifting or that this would be me. And then, on a quiet Thursday night, we decide to do something crazy like learn how to climb a rope. And then we actually do it and have the burns to prove it. As I left the gym last night, my coach slapped me on the back and said that I made huge leaps with my personal fitness. And he had a huge grin on his face. This entry was posted on Friday, March 5th, 2010 at 9:42 pm and is filed under life & observations. You can follow any responses to this entry through the RSS 2.0 feed. You can leave a response, or trackback from your own site.